Declining to write a real review or rate this book. I'm not going to rehash my personal opinions about other off-site issues because we went there already on my review for Flat-Out Love. My opinions haven't changed and I won't be reading anything new by this author, but I wanted the closure for Matt and Julie's story that I didn't get in FoL, so I decided to read this short follow-up companion for that reason.Moving on. 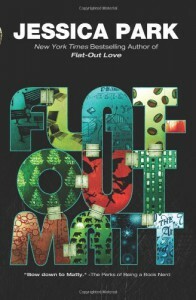 If you haven't read Flat-Out Love, do not pick this up or you will be confused. There is a prequel to FoL, a few of the FoL chapters re-written in Matt's PoV, and an epilogue to FoL from Julie's PoV. Everything jumps all over the place and you won't really get the gist of the story if you try to read this first. For what it's worth, I didn't realize that Matt would be so into oral, so that was a nice little surprise.